Each year in August, we celebrate the birthday of our store bird, PICKLES, the Sulphur-crested cockatoo. We throw a BIG PARTY and invite all her friends. (That would include everyone who shops at B&B Pet Stop for their birds and bird supplies!) This year, she’ll be 11 years old. You and anyone you know who has a pet bird – or who is THINKING of getting a pet bird – is invited to come to Pickles’ “Bird”thday Party! The best part about the “Bird”thday Party is seeing ALL THE BIRDS! Our guests over the years have included everything from tiny parakeets and cockatiels to super-huge macaws. The store will be chock-full of wonderful, colorful birds. 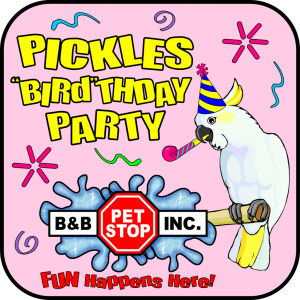 There is no cost to attend Pickles’ “Bird”thday Party, but you must bring your bird to the party to get the free stuff. At the party, your bird will enjoy a trip to the TREAT BUFFET – where we open packages of many of the treats we sell and let your bird sample them. We’ll fill up a little bag of your bird’s favorites to take home as a party favor. Stop by the NUTRITION TABLE to learn the latest on bird nutrition. Birds are smart and curious. At the TOYS + CAGES table we’ll talk about what makes a great toy for your breed of bird. Also – learn what’s new in cages and perches for optimal human/ bird interaction. At Pickles’ “Bird”thday Party we’ll have TWO birthday cakes – one for people and one for BIRDS! We’ll cut + serve the cakes around 1:45 pm.